What's The Worst Thing You Can Put On Your Car? Part of the joy of owning a car means you get to personalize it in some way, and, like the aftermath of radioactive arthropod bites, that great power comes with great something. Let's say culpability. There's all kinds of things you can put on your car. So what's the worst? 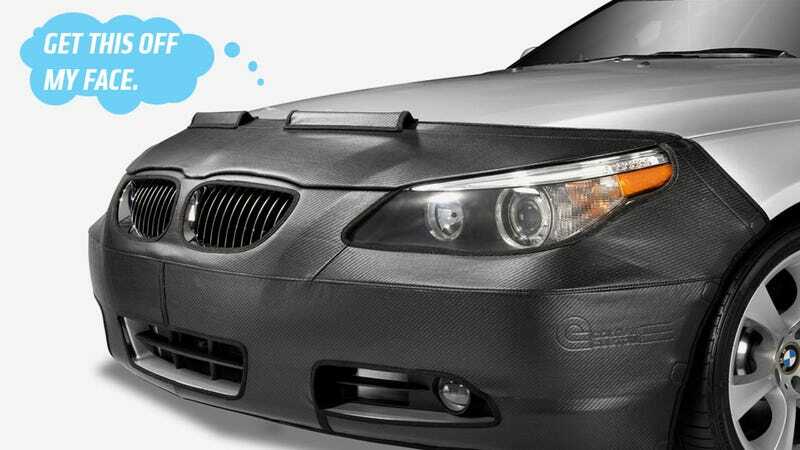 There's been trends for various car dress-up and personalization items for years, and there's many awful ones. I always hated those chrome strips that outline doors and panel gaps, and of course there's the fake chrome scrotums popular in the truck world. But I think in a more mundane way, the black leather car bra has a special kind of awful. They're meant to preserve the car's paint from chips and dead bugs, I guess, but they always end up making the car look worse, somewhere between a grandma's couch with plastic on it and the car about to knock over a liquor store. I never liked those. So what's worst in your book?